Commander Rick Husband’s wife donated his collection to their alma mater. Some photos courtesy Southwest Collection/Special Collections Library-Rick Husband Collection and McCool family. On a bright Saturday morning 13 years ago today, the space shuttle Columbia was on its way back to Earth from a 16-day mission. Due to land in Florida, the shuttle instead disintegrated over Texas a mere 16 minutes before its scheduled landing, killing the entire crew. In the same instant the world lost seven of its best and brightest people, the Texas Tech University community lost two of its own: pilot Willie McCool, the son of university faculty members, and commander Rick Husband, a Texas Tech alumnus. And 1,300 miles away, a fellow Red Raider realized how close he'd come to joining his friends. 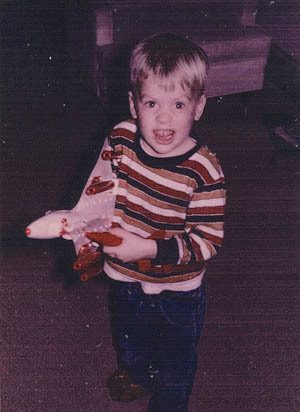 A young Willie McCool plays with a model airplane. As the oldest son of military parents, Willie McCool was raised all over the world. Born in San Diego, he'd lived in Minnesota and Guam as a child, becoming the island territory's first Eagle Scout. After his mother, Army Medical Specialist Corps Col. Audrey McCool, was hired to teach nutritional sciences at Texas Tech, Willie arrived in Lubbock and settled in as a junior at Coronado High School. “He was a normal, everyday kid, interested in doing a lot of things,” said Audrey, who was earning her doctorate in education while teaching. “He had a younger brother and sister, so he was in charge of the kids and keeping them organized. He was in scouts, on swim team, he was active in school. At Coronado, he was in the science club and running track, which he started in high school. He was on the Coronado cross country team and had some records there. Outside school, Willie sang in the youth choir at the First Methodist Church, which allowed him to see even more of the world. Willie's father, Lt. Commander Barry McCool, was a naval flight officer stationed in California at the time, so he flew back and forth when he wasn't deployed. 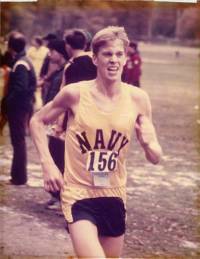 Willie McCool ran on the Naval Academy’s cross country team during his four years there. As the end of high school approached, Willie applied to the United States Naval Academy. After a friend was accepted to the Air Force Academy, he talked Willie into applying there as well. He was accepted at both, but ultimately chose the Naval Academy because Al Cantello, a retired Olympic javelin thrower, was the coach for the Naval Academy's cross country team – something Willie knew he wanted to be a part of. 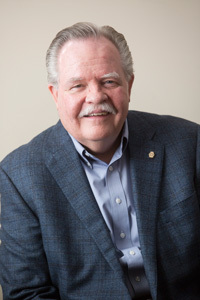 “I was out on a carrier flying when he applied,” said Barry, who is now a professor in Restaurant, Hotel and Institutional Management at Texas Tech. “I didn't even know he applied to the academy until they notified me out there on the ship that he'd been accepted. I felt shock and pride: Shock because I had no idea he wanted to follow in my footsteps as a naval aviator and pride that he was going to the Naval Academy because that's a real big deal. Only about the top half percent of all high school graduates get accepted into any of the academies, so to be accepted at any of the academies is a great honor. 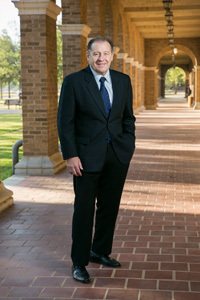 Rick Husband was born and raised in Amarillo and arrived at Texas Tech in 1975 to study engineering. 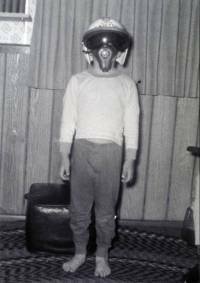 He had known since childhood he wanted to be an astronaut and was set on making it happen. A young Rick Husband poses in his Steve Canyon helmet. In January of his sophomore year, Rick went to a Texas Tech basketball game at Municipal Coliseum. There in the row in front of him sat a girl he knew by sight but couldn't put a name to the face. The couple's first date was four days later. Rick Husband sent this letter to NASA from his Texas Tech dorm room, 612 Murdough Hall. 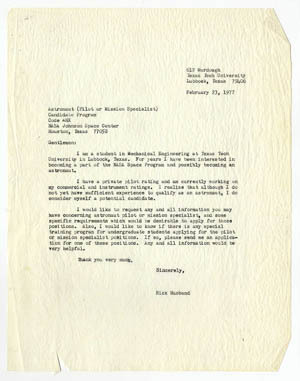 Less than a month after that first date, Rick wrote a letter to NASA from his Texas Tech dorm room, 612 Murdough, asking for information on becoming either an astronaut pilot or a mission specialist. He wanted to know what requirements he would need to fulfill and if any special training programs existed for undergraduate students heading that direction. If there were, he requested an application. But even while focusing on space, the mechanical engineering major didn't miss opportunities on the ground. After four years of running track and excelling at the Naval Academy, midshipman Willie McCool graduated second in his class in 1983. The top 1 percent of the class was sent to the University of Maryland for master's degrees, so in 1985, Willie finished his master's in computer science. Flight training was next on his agenda. Willie McCool poses with his young son. After three years and two deployments, he was selected for the U.S. Naval Postgraduate School/Test Pilot School in Monterey, California. In 1992, he graduated top of his class from there, too, with a second master's degree, this time in aeronautical engineering. In Lubbock, Rick Husband had started his military career, too. He joined the Reserve Officer Training Corps (ROTC) program at Texas Tech and upon his graduation May 10, 1980, he was commissioned a 2nd lieutenant in the U.S. Air Force. He and Evelyn discussed marriage throughout college, but both had goals they wanted to attain first. “He had a deferred assignment because there were too many people starting pilot training,” Evelyn said. Rick worked for six months for an engineering firm in Amarillo, waiting to begin his active duty service in the military. In October, he began pilot training at Vance Air Force Base in Enid, Oklahoma, while Evelyn moved to Dallas to work for WBAP radio. “He went through a year of pilot training that every pilot in the military goes through,” Evelyn said. “It was a very grueling schedule. Some weeks he was flying late at night, some mornings he had to be in at 2 a.m. Both he and I knew that would have been an extremely difficult challenge to start a new marriage, so I'm glad we made that decision to wait until he was finished with that. 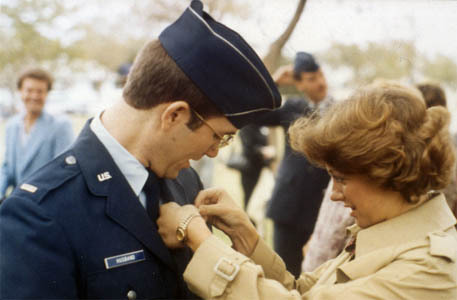 Evelyn Neely pins pilot wings on her fiancé Rick Husband at the completion of his pilot training. The newlyweds started out at Homestead Air Force Base in Florida where Rick was assigned his first aircraft, an F-4. After training, he flew the F-4E for two-and-a-half years at Moody Air Force Base in Georgia. He went through F-4 Instructor School back at Homestead in 1985 and was assigned as an academic instructor and F-4E instructor pilot at George Air Force Base in California. In December 1987, Rick was assigned to Edwards Air Force Base in California. While there, he took a satellite course on base to earn his master's degree in mechanical engineering through Fresno State University. 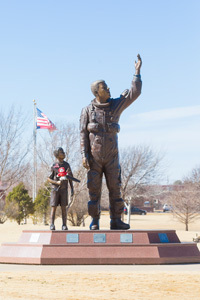 Willie McCool was selected for NASA in April 1996 in the largest class ever accepted. 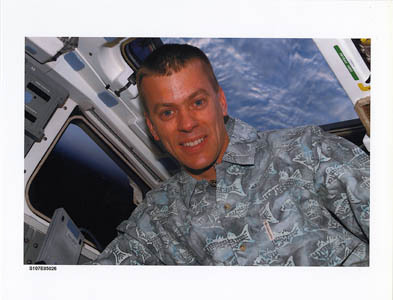 Willie McCool's official NASA photo. When it was Willie's turn for crew assignment, the head of the astronaut department wanted him to continue the development of the software for the shuttle, so he was asked to delay his opportunities to fly. “His classmates were flying sooner than him and it was actually kind of an irritation for him to be doing software while the other guys were flying,” Audrey explained. “But when you go to become an astronaut, you go to fly,” Audrey said. Rick was certainly doing his share of flying – just not in space. After the Challenger explosion on Jan. 28, 1986, killed its entire crew, NASA had stopped all space shuttle missions for three years to determine the cause. Rick applied to NASA once during that time but found they were not hiring. After eventually being granted an interview – a feat in itself, Evelyn said, as fewer than 100 people were interviewed out of thousands of applicants – Rick knew he had two options: He would be given another assignment, probably overseas, or he would become an astronaut. 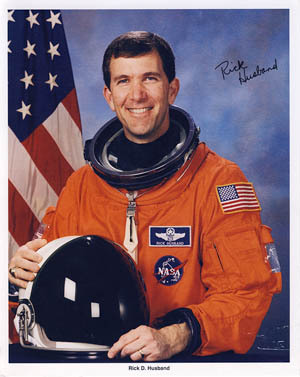 Rick Husband's official NASA photo. He was not selected on his first application, although coming so close encouraged him, Evelyn said. In June 1992, the pair and their young daughter, Laura, moved to England where Rick flew with the Royal Air Force Base as an exchange test pilot. 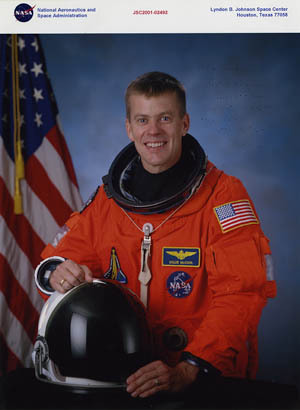 Rick's astronaut career, more than 30 years in the making, began in February 1995. 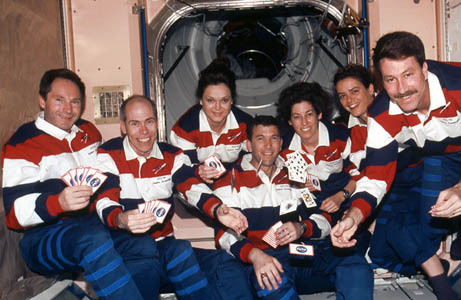 Rick Husband, center, poses in space with the crew of his first mission. Rick was one of the last people in his astronaut group to be assigned a flight, but Evelyn remembers he kept his cool. Both NASA pilots, Rick and Willie met in the astronaut office and immediately hit it off. 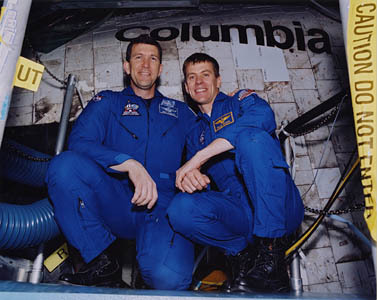 Rick Husband, left, and Willie McCool pose outside the Columbia space shuttle during their training. Rick heard rumors long before the actual announcement was made about STS-107 that he was being tapped as commander and that Willie was going to be the pilot. In addition to Rick and Willie, the crew included mission specialists David M. Brown, Kalpana Chawla, Michael P. Anderson and Laurel B. Clark and payload specialist Ilan Ramon, NASA's first Israeli astronaut. 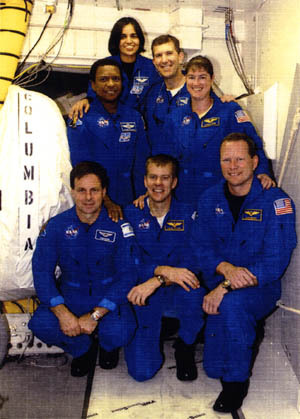 The Columbia crew poses outside the shuttle during training. During the 16-day mission, the crew needed to complete more than 80 experiments on board. But because the mission was delayed repeatedly, extending their training time to nearly two years, the crew had plenty of time to become familiar with the tasks. 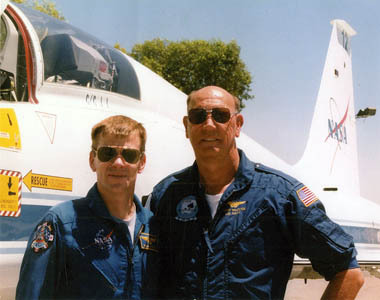 Al Sacco, dean of the Texas Tech Whitacre College of Engineering, flew on the Columbia as a payload specialist for STS-73 in 1995. “That was called the United States Microgravity Lab 2 (USML2) and it was a science mission, mostly around material science but also fluid dynamics,” Sacco said. “We looked at the growth of protein crystals; we grew the first HIV crystals in orbit, which they used in part to develop the retrodrugs; we grew zeolite crystals, a catalyst for the petroleum industry, to try to figure out how to make them more active; grew a lot of crystals that are used in imaging equipment to look at the reduction of defects; did a lot of fluid dynamic experiments, a lot of biological experiments, ran the whole gamut. Sacco said he came close to doing the experiments himself. Barry was teaching at the University of Nevada-Las Vegas at the time, and Willie flew out to speak to his father's class about NASA and the manned Mars mission. 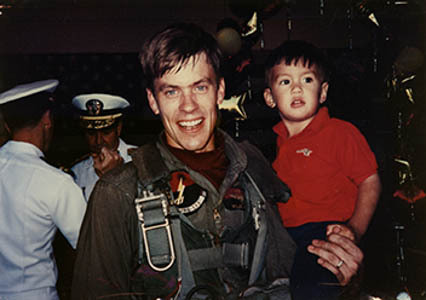 Willie and father Barry McCool, both Navy pilots, pose together in their flight uniforms. “We had to reschedule where we held it because there was more faculty from all over the university that showed up than my students,” Barry recalled. “We had to go to the big auditorium where he did an outstanding presentation on all the factors of the manned Mars mission and why it's a minimum 3- to 6-year mission to go to Mars. He had a lot of insights and information on that particular endeavor. But instead of looking to their son's potential future, Barry and Audrey were focused on getting his first mission out of the way. “You can't do anything until you've done that,” Audrey said. In the days leading up to the launch, the crew went into quarantine – a normal NASA procedure designed to keep crew members from getting sick before a mission – and communication with the outside world was heavily restricted. Notes from Husband's personal files. As the excited families gathered to say their farewells, the McCools had mixed emotions. 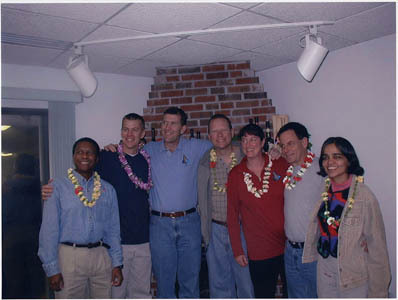 The crew poses for a photo during the family barbecue the night before the shuttle launched on its final mission. Evelyn remembers mostly the good parts. “We'd flown there a few days before, had a reception and I'd spent time with Rick,” she said. “He was in quarantine at that point so unfortunately Laura and Matthew couldn't see him; they were 12 and 7 at the time. But Rick and I got to spend time together, and my parents and Rick's mom and brother got to see Rick. Evelyn, Laura and Matthew woke up in their hotel room on the morning of the launch, Jan. 16, 2003. Rick had arranged for presents to be delivered to his family members after the launch. 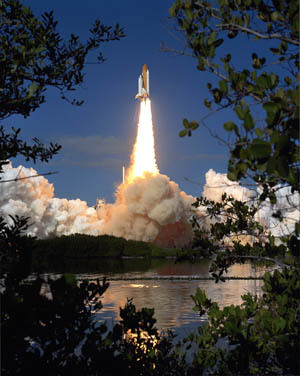 Space Shuttle Columbia lifts off from Kennedy Space Center on Jan. 16, 2003. As the McCools sat in the bleachers overlooking Columbia at Kennedy Space Center, Barry thought about the little boy he'd seen grow up into an incredible man. “You see the big board clicking 10, 9, 8 with the shuttle in the background and everything, and I'm sitting pretty high up in the bleachers with Audrey and the family, waiting for it to go,” Barry said. “And when it launches, there's this tremendous resonance like kettle drums at the symphony. You can feel the resonance in your chest. And the ground's shaking. And you see this beautiful Chamber of Commerce Florida day with the bright sunshine and a few clouds and the Columbia launching and going up, and it was about 10 or 15 seconds into the launch when it kind of hit me, ‘that's my little boy sitting on 2 million tons of TNT going into space.' And tears kind of run down the cheeks at that point. Sacco says he knows from experience what the mission would have been like for the people on it. “They would have had a ball; I knew exactly what they were doing and how they were doing it. They would have had a lot of fun,” he said. 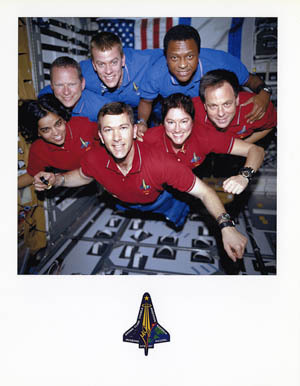 The Columbia crew took this photo of themselves while in space. It was called "the miracle photo" because the film was found intact inside the camera after the explosion. “I know you've seen pictures, but it's not the same as being there,” Sacco added. “The earth is strikingly beautiful and they would have been wowed by that. The freefall environment of low-earth orbit, what people call zero gravity, is a very pleasant environment once you're in it. Your body gets used to it – it's a lot more pleasant than being here on the ground. And it's fun; it's just a fun place to be. You realize the magnitude of the cosmos, the universe. You realize that the earth is just like a small grain of sand on a very large beach. It's very humbling because you realize that you're a very small part of the earth, which is an infinitesimal part of the universe, so it's really very humbling when you realize we're not very important in the whole scheme of things. I'm sure they felt that; everybody does. Sacco did receive microwave messages from the crew during their mission, which Mission Control forwarded to him. Spouses and mission control were the only ones able to speak to the shuttle crew. Evelyn remembers the last time she spoke with Rick was on Jan. 28 – exactly 26 years after their first date and 17 years after the Challenger explosion. 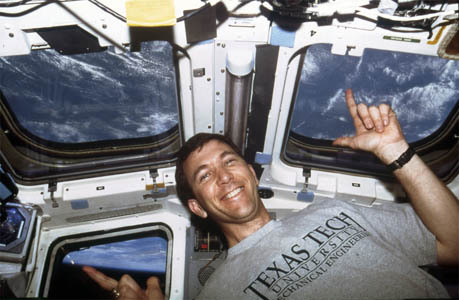 Rick Husband gives a "Guns Up" from space in his Texas Tech University Mechanical Engineering T-shirt. The final day of the mission, Sacco received a message from one of the women on board. On the morning of Columbia's planned return to Earth, Barry and Audrey McCool watched the capsule fly over their home in Las Vegas. Willie McCool poses with Earth in the background. Inside the house, Barry had CNN on the television and NASA Direct on the computer. NASA Direct was airing audio from the capsule communicator (CAPCOM), the person at Mission Control responsible for communicating with the shuttle crew. He could hear in the background the radio transmissions from the Alamogordo, New Mexico, tracking station. In retrospect, Audrey said, the shuttle was already starting to break apart as it passed over Las Vegas. In the bleachers at Kennedy Space Center, Evelyn and her children had watched the skies eagerly as the countdown clock got closer and closer to the landing time. While waiting, she called her father in Amarillo. Eventually the news came: the cabin had broken apart upon reentry and there were no survivors. Shortly afterward, the families had a conference call with President George W. Bush extending his sympathy and concern. 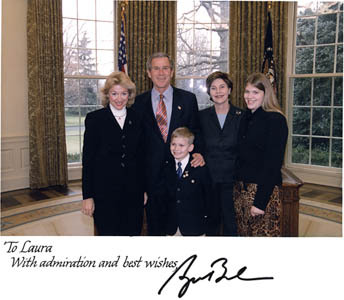 Husband family meets with President George W. Bush. “At that point, when you walk through a crisis or something like that in your life, everything kind of slows down,” Evelyn said. “It gives a very surreal feel to it. It's shock, and it's also a gift from God to not feel the full assault of the information you're receiving. Sacco remembers he was vacuuming the rug in the bedroom of his Boston home when his phone rang. It was one of his former crewmates, Michael López-Alegría. “He said to me, ‘Did you hear that the Columbia is 14 minutes overdue?' and we both knew what that meant: It was on the ground. The question is, was it in one piece or not?” Sacco said. “And when they couldn't find it, if you're in that business you know it had to have come apart because otherwise they would have been able to locate it quicker. 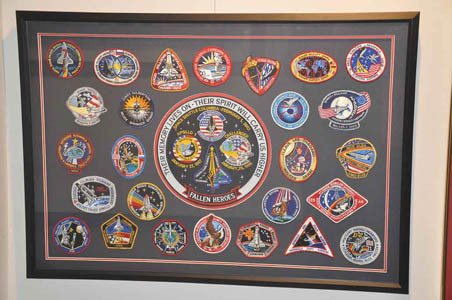 These patches, taken into space by the Columbia crew, were found after the explosion. Reflecting on the loss of his friends, and the fact that he could have been with them, Sacco had mixed feelings. After the families were taken back to crew quarters, everyone in the bleachers was still waiting. 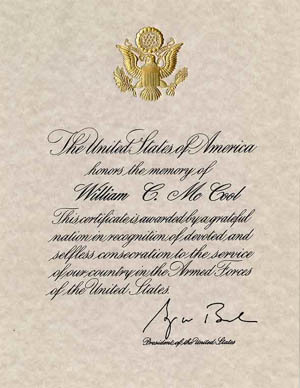 Willie McCool was posthumously honored for his service to the United States. The non-immediate family members were put in a room, still with no official information. The families were hoping for a miracle. “They're sitting there waiting for the shuttle to land,” Barry said. “They know you don't have any fuel to go around. You land or you don't. They're thinking, ‘Where's the shuttle? We haven't heard the sonic booms that break the sound barrier.' None of that's happening and NASA's saying nothing. As Evelyn struggled to process the news of Rick's death, she also had to focus on one hard reality: she was now a single mother to Laura and Matthew. “As a mom, my first concern was for my kids, so I was extremely focused on them and their well-being,” she said. “We were all devastated and we were in shock; we weren't even really crying, just trying to grasp it. I remember looking up at the sky when they didn't land and just not even being able to wrap my mind around the fact that that was it, that Rick's life had come to an end. He was 45 years old. It took me a very long time to even grasp that; it was so difficult to process. Husband at family church in Houston. While Evelyn's family waited at the crew quarters, someone from NASA went to their hotel room to pack their things for the trip home. In a moment of clarity, Evelyn remembered to ask for something she didn't want her children to lose: the videotaped devotionals from Rick were in the hotel room's TV cabinet. The families flew home later that day on a private NASA plane, the same one they would have taken home the following day with the shuttle crew if all had gone according to plan. People from all over the world sent cards, flowers and more to the families of the Columbia crew. As word of the tragedy spread, tributes began raining down upon NASA. Letters, cards, quilts, stuffed animals, songs, poems and more came in from school children, dignitaries – any and every group. 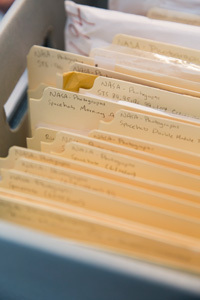 NASA collected it all, and then cataloged, managed and handled it for the families. The worst part for Evelyn, though, was waiting for closure. This map shows Columbia's flight path – directly between Lubbock and Amarillo – in its final seconds. “They didn't find the crew remains immediately, so for several days we didn't even know if those would ever be found,” she explained. “The last moments the shuttle was flying, it went between Amarillo and Lubbock. Rick was sitting on the Amarillo side and Willie would have been sitting on the Lubbock side, almost like flying through a goal post. So when they crashed, it was all over East Texas. 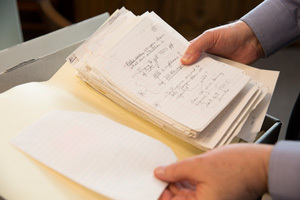 More than seven years later, in the spring of 2010, Monte L. Monroe, archivist of the Southwest Collection at the Southwest Collection/Special Collections Library at Texas Tech, received an unexpected call from a friend. 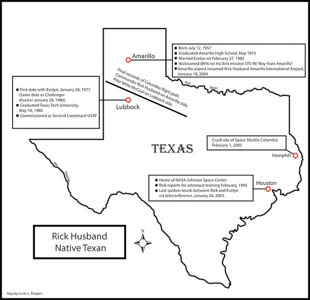 Susan Smith, who worked in institutional development for Texas Tech in Houston, went to elementary school with Rick in Amarillo and wanted to know if the Southwest Collection would be interested in Rick's records. Monroe jumped at the opportunity. Monroe gave Evelyn an extensive tour of the archive, answering many questions and setting her mind at ease that she could donate what she wanted. Laura was then in college and Matthew in high school. Evelyn wanted to make sure she didn't move too quickly and end up donating something the kids would want when they were older. “Rick and I have an absolute love for Texas Tech: our alma mater, where we fell in love, met and married later, so it was something I didn't have to struggle with at all,” she said. “When I figured out that was an option for all of his collection to go to Texas Tech, it made absolute perfect sense; it was a perfect fit as such an integral part of our lives. And I knew, absolutely without any hesitation, that Rick would have been so thrilled that I made that decision. One of more than one hundred boxes in Rick Husband collection. On Nov. 11, 2010, Monroe and Southwest Collection registrar John Perrin drove from Lubbock to Houston to pick up the Rick Husband collection from Evelyn and Bill Thompson, who she married in early 2008. “We took these things out of a storage shelter, out of the garage and out of their home and they'd never been tampered with since they were put in storage. Most of the family members of Columbia and Challenger are still having a hard time coming to grips with this, so many times these things are left in storage,” Monroe said. “We loaded all this stuff up in pouring rain in Houston. We didn't get back until late at night. I can remember driving across Texas in our big 1-ton van with materials right up against the back of our heads because we had to pack and repack that van twice just to get it all in there. 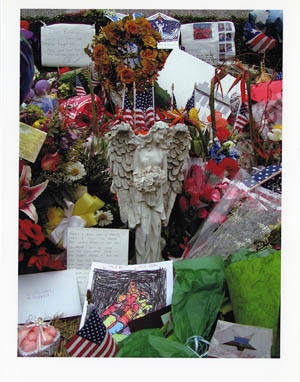 Rick Husband's CD of "James Taylor's Greatest Hits" was recovered after the Columbia explosion. In Evelyn's words, having Rick's materials at the Southwest Collection has been a godsend. 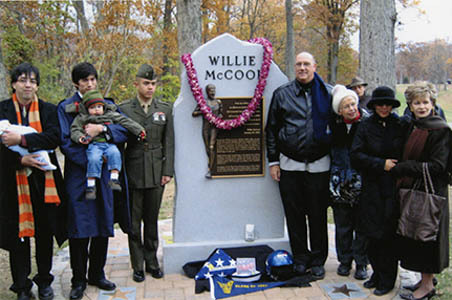 Willie McCool’s family pose with his memorial at the Naval Academy. The McCools have shared their private pictures of Willie, which they allowed the Southwest Collection to digitize, and one day those materials will be donated as well, Monroe said. But the bulk of Willie's materials are still with his wife and three sons. The oldest is a captain in the Marine Corps, living in Okinawa, Japan, with four children of his own. The middle son is a media specialist in Washington state, living near his mother to help her. And the youngest is an artist in New York City. Rick and Evelyn's children have grown up, too. Matthew is 20 years old and a student at John Brown University. Laura, 25, graduated from Trinity University and now serves on the National Challenger Board of Education, working with Challenger labs throughout the country. 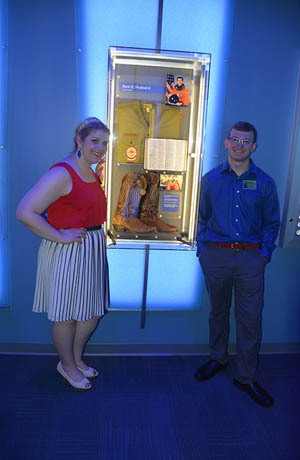 Rick Husband's children Laura and Matthew pose with their father's memorial at NASA's new Forever Remembered: Space Shuttle Memorial exhibit at Kennedy Space Center. “It was tough on these families and you have to be sensitive to that,” Monroe explained. “It's much different than going out and picking up a ranching collection, let's say. Even though those kinds of collections are just as meaningful to their family members as this one is, it was because of the national and international exposure this event got that made it so tough on the families, I believe. When a Columbia museum was established in Hemphill, Texas, where most of the debris was recovered, Monroe helped fulfill Evelyn's desire for Rick to have a presence there. Over the past two years, they have worked with NASA and the Kennedy Space Center on a Fallen Heroes exhibit that became a component of the Atlantis Space Shuttle display and complex on the Kennedy Space Center compound. “Our staff worked very hard to make that happen because we felt that we needed to properly honor these great Americans,” Monroe said. “This is a world-class collection and we're very proud to be the archive of record for that collection. Hopefully we'll gain some of the other family members when they're ready to do it. We made it apparent to them that Texas Tech has a great interest in that. On Feb. 1, 2003, when the Space Shuttle Columbia broke apart just minutes before its scheduled return to earth; America lost seven heroes. Evelyn Husband, wife of Columbia's commander Rick Husband, lost much more—the love of her life, the father of her children, the backbone of her family. 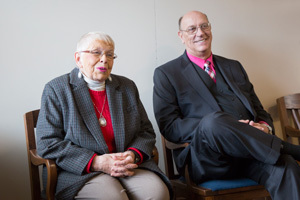 On February 18, 2016, at the Monterey Foundation Gifted Servants Dinner, Evelyn will share how her faith guided her and her children though this personal and national tragedy. The extraordinary grace with which Evelyn has handled this tragedy and the unexplainable peace she has experienced in the midst of her suffering have made Evelyn an inspiration to millions of people across the country and an endearing figure worldwide. 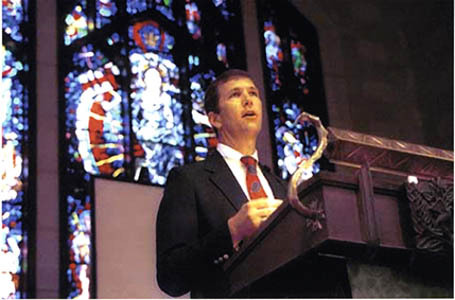 Author of High Calling: The Courageous Life and Faith of Space Shuttle Columbia Commander Rick Husband (Thomas Nelson, 2004) and noted speaker, Evelyn travels encouraging audiences with her story of triumph over tragedy and her message of finding hope in the midst of life's trials. 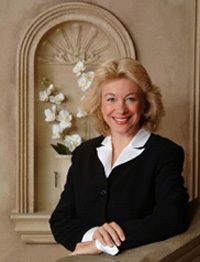 Both Evelyn and Rick graduated from Texas Tech University. Single tickets for the Monterey Foundation Dinner are $50. A table of 8 is $350. Corporate Sponsorships that include a table of 8 and special benefits are available for $1500. For tickets and additional information please call 806-795-5201 between 8:00am and 5:00pm, Monday through Friday.